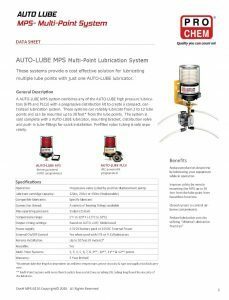 Auto-Lube HPS 240 | Pro Chem, Inc. 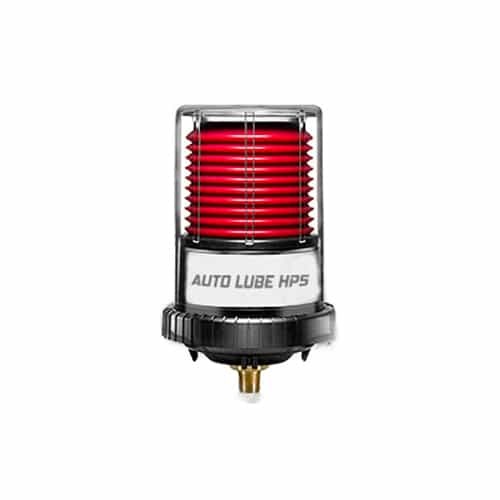 The AUTO-LUBE HPS is a reusable, battery powered, electro-mechanical lubricator. It’s constant 350 psi lubricant output pressure allows the unit to be direct mounted, remote mounted up to 30 feet away from the lube point, or coupled with a progressive distribution block to lubricate from 2 to 12 lube points. This model dispenses 240 cc of lubricant and is self-contained, no external wiring required and can be used plant wide on a variety of applications. The AUTO-LUBE HPS daily lubricant output is programmed using the simple AUTO FITTING system. The red, white and black timing rings determine how often the lubricator will cycle. The seven basic time settings required to handle most applications are programmed by using one, two or all three colored timing rings. To fine tune the lubricant output, you can adjust the piston stroke by installing the spacer washers into the AUTO fitting yielding 52 output settings. Once set and installed, the program is retained in the AUTO fitting allowing the user to install a different AUTO-LUBE HPS lubricator without having to reprogram the unit. The AUTO-LUBE HPS metered positive displacement pump has been primed before shipment and is ready for use. On first installation, all fittings, lube lines and bearings should be precharged with the same lubricant that was ordered with the Auto-Lube HPS lubricator. Next, program the AUTO fitting. The HPS unit will cycle once and proceed to follow the program setting. Periodic visual insepection is recommended for all Auto-Lube lubricators. When the lubricant cartridge is empty, unscrew the Auto-Lube HPS lubricator from the AUTO fitting. Place the unit on a firm surface, outlet end down. Push down on the clear plastic housing while turning the black plastic locking ring counterclockwise. The housing and spring assembly will separate from the pump base. Remove the empty cartridge and battery pack and replace with a new one.